Pop Quiz: Can you recognize these blockbuster stories? An orphan who lives with with unsympathetic relatives receives an invitation to attend a special boarding school. At school, the orphan and his classmates uncover a plot to rob the school of a precious resource, orchestrated by the villain who killed the orphan's parents. The orphan, with the help of his trusted classmates, prevents the robbery, outwits the villain, and saves the school from harm. A single woman starts a relationship with her scandalous boss. The woman discovers her boss is cheating on her and starts looking for a new job. The woman gets a new job and a new (nicer) boyfriend. A respected criminal leader is injured, but not killed, in the opening attack of a gang war. The leader’s sons continue the battle and the favorite son, previously uninvolved in crime, is forced to flee after a double murder. The favorite son returns from exile, ends the gang war, and takes over his father’s leadership position. Each of these sets of three sentences in the quiz is what Steven Pressfield has called the Story Spine. These are not three random sentences. The BIG scene your readers are expecting you to deliver. How does it work? Let’s tackle each bullet point one by one. Humans form an emotional bond with characters who experience change. Your Story Spine helps you see how your protagonist will change from beginning to end of the book. This change will be along the spectrum of a core human need. That core need is what's at stake in your story. Each content genre has a specific need at stake. In the first story from the quiz, two notable changes occur from beginning to end of the three sentences. Let’s review. An orphan who lives with with unsympathetic relatives receives an invitation to attend a special boarding school. At school, the orphan and his classmates uncover a plot to rob the school of a precious resource, orchestrated by the villain who killed the orphan's parents. The orphan, with the help of his trusted classmates, prevent the robbery, outwit the villain, and save the school from harm. This is the Story Spine of Harry Potter and the Sorcerer’s Stone. The first change is that Harry starts a nobody and ends a hero. (With an assist from Ron and Hermione, of course.) The second change is that Harry starts an orphan and ends as the leader of a heroic team. From the Story Spine, we know that Harry needs to be powerless in the beginning. That is so readers can appreciate the shift to when he becomes powerful. We also know that survival is what’s at stake. Harry and his friends are risking their lives to thwart the robbery. 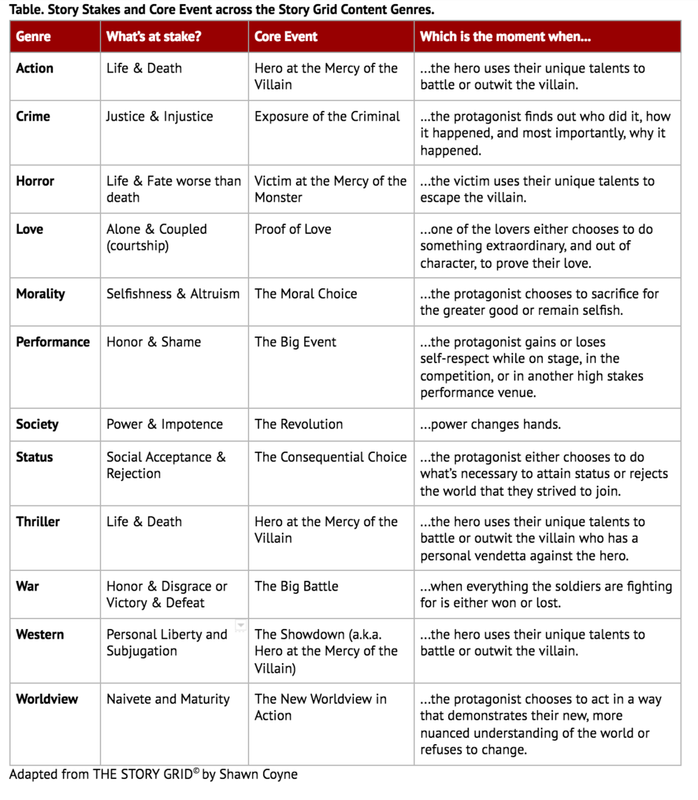 If we look at the table below, we can see that stories with life and death stakes are either in the Action or the Thriller content genre. Because the villain, Voldemort, has a personal death wish for Harry, we’d classify this as a Thriller. This is also a story about friendship and teamwork. We can infer that Harry’s friends are putting their own lives on the line when they help him confront the villain. The content genre that’s about this type of self-sacrifice is the Morality genre. Because it’s the friends doing the self-sacrificing and not the protagonist, we’d say that the Morality genre is the secondary content genre. The Thriller genre is the primary one. Because if you're dead? Well, you're dead. Identifying the genre from our Story Spine tells us something about the scenes that we must include in our story. Every story must include the obligatory scenes and conventions from its primary content genre. One of these obligatory scenes will be the Core Event, the BIG scene that readers are waiting for. The Core Event is the turning point in your entire book or movie. Every scene that precedes the Core Event sets up your characters to either succeed or fail at this moment. Every scene that follows the Core Event shows the characters experiencing the consequences of their actions in the Core Event. Let’s review the second set of three sentences from the quiz. This is the Story Spine of a love story. Specifically, it’s based on the movie Bridget Jones’s Diary. We know from Table 1 that the Core Event of a love story is the Proof of Love scene. This is the pivotal moment when one of the characters chooses to do something extraordinary, and out of character, to prove their love to the other character. In the movie Bridget Jones’s Diary, the Proof of Love happens when Mark Darcy gives Bridget the exclusive interview with his client to save her from being fired from her job as a TV reporter. Darcy is a well-respected, prim and proper, human rights lawyer. Under normal circumstances, there’s no way he’d let his client do a TV interview, especially not one for a lowbrow TV show like the one that employs Bridget. Darcy takes a big professional risk allowing the interview, which is why viewers hearts melt and so does Bridget’s. In addition to helping you find your genre and identify the Core Event of the story, the Story Spine also breaks your story down into three acts. Each sentence in the Story Spine corresponds to one act. Let’s review the third story from the quiz. A respected criminal leader is injured, but not killed, in the opening attack of a gang war. The leader’s sons continue the battle and the favorite son, previously uninvolved in crime, is forced into exile, after his first murder. The favorite son returns from exile, ends the gang war, and takes over his father’s leadership position. This Story Spine is based on the movie The Godfather. First things first, let’s identify the genre and the Core Event. While you’d market this story to fans of crime fiction, this story isn’t about whether the bad guy gets away with the crime so much as it’s about a power struggle within and between rival families. The content genre focused on power struggles is the Society genre. The core event of a Society story is The Revolution, the moment when power changes hands. Each of the sentences in the Story Spine defines what changes from beginning to end of one act. Each one of those changes is related to the core value at stake, power. At the beginning of the first act, the father shifts from being healthy and in power to incapacitated and at least temporarily, benched. In the second act, the sons strive to win back the power lost when their father was injured. The act starts with the sons taking action, and ends with the favorite son in retreat. We also know that Michael, the favorite son, will need to shift from uninvolved outsider in the first act, to a murderer in the second act. He’ll need to learn practical lessons about shooting and encounter reasons to continue a shift in his moral compass. In the third act, Michael will complete the shift in his moral compass, and have learned everything he needs to take over the reigns of power. Even though this story has many characters, we know that Michael is the protagonist because he is the one who changes the most and he is the one who is the one who acts to create The Revolution, the Core Event for this story. The Story Spine helps you recognize your genre and see how your protagonist needs to arc from beginning to end of the story. It helps you see how your characters need to evolve within each act so that they are ready to succeed or fail in your Core Event. Most of all, it helps you stay focused on the core human need at stake in your story so you can write a book that strikes a primal urge and keeps readers glued to the page. Perfect the Story Spine of your novel.